A Bronx woman was arrested after she sicced her two pit bulls on a man she was arguing with. 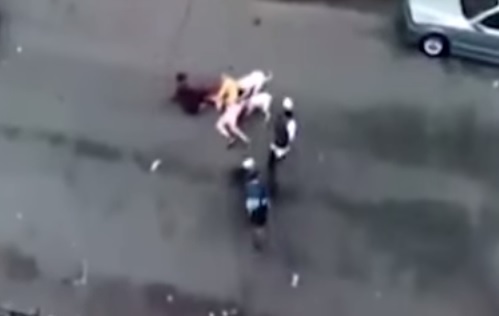 The dogs mauled the man for several seconds until onlookers attempted to intervene. The man suffered severe cuts to his ear, head and body. A woman has been charged with felony assault with a weapon — her two pit bulls. Cynthia Oliver allegedly sicced her pets on a man she was arguing with on a Bronx street. The bloody attack Friday ended with the man hospitalized with a severed ear and Oliver, 35, jailed in lieu of $35,000 bail. Video shows the white dogs biting and dragging the prone and cowering victim across Belmont Avenue as neighbors rush to drive them off by spraying them with water from a hose and swinging at them with chains and a small shopping cart.